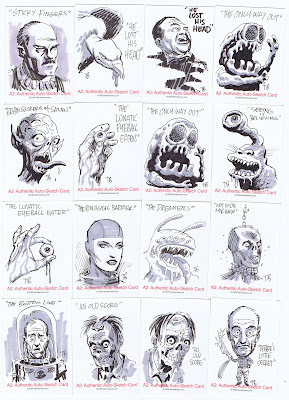 Scary Terry's World: SHOCK STORIES & URBAN LEGENDS sketch cards! Taking a break from the vintage comics and Big Funny posts to get back to the soon to be released Shock Stories and Urban Legends trading cards I drew for Monsterwax. 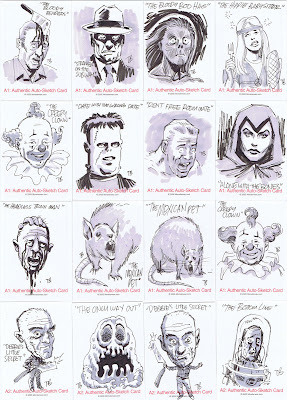 One of the most fun assignments I've ever had was turning out 250 sketch cards for the sets. For those who don't know, sketch cards are original art cards randomly inserted in card packs. These are all ink and marker, and feature different views of the characters from the cards. My intern from MCAD, Hannah Blumenreich, helped out with pencil roughs for some of these. The "Mexican Pet" images show off her drawing skills especially. These are a "best of" preview of the cards -- we drew a lot more! If you happen to get one in your box of cards, please let me know what you got, will you? And if your response to some of these is "Eeeuwwww -- gross!" then you got it right! PS: please leave a comment if you enjoy what you see here -- I know from the counter I just installed that folks are looking at this blog -- but some feedback would be really nice -- thanks! UPDATE: here's an article on the 3-D subset cards!